President Obama on Friday is scheduled to sign into law a new nearly $1 trillion federal farm bill that has lots of things for lots of people to love or hate. Cut overall expenditures by $17 billion from current spending levels. Reduce food stamp benefits by $800 million per year, about 1 percent. Cut $5 billion a year in direct subsidies to farmers. Cut overall conservation spending by about $6 billion, about 10 percent. Increase crop insurance subsidies for farmers by $7 billion over 10 years. But the bill, which passed the Senate on Tuesday, was praised by some conservation groups because it will restore a requirement that farmers seeking crop insurance coverage follow certain minimum conservation practices. The Freshwater Society had advocated for that so-called “conservation compliance” provision in the legislation. Read the New York Times coverage of the bill. Read an Associated Press article, published in the Star Tribune. Read an Environmental Working Group statement on the bill. Read a good description of the conservation compliance provision, written before final passage, from the National Sustainable Agriculture Coalition. Read a Ducks Unlimited statement praising the conservation compliance. Two of Minnesota’s members of Congress — Betty McCollum of St. Paul and Keith Ellison of Minneapolis — were among more than 100 House Democrats who signed a letter this week urging the House Republican leadership to support making compliance with certain minimum conservation standards a requirement for farmers seeking government-subsidized crop insurance. The letter anticipates House action on the long-stalled federal Farm Bill. A Senate-passed renewal of the Farm Bill would require the conservation compliance. A bill approved by the House Agriculture Committee in July did not include the compliance. Read the Democrats’ letter. Read a 2012 newsletter column by Freshwater Society President Gene Merriam supporting a conservation compliance provision as a tool for preventing water pollution. Read a scholarly paper on Iowa farmers’ attitudes toward requiring compliance with conservation practices that protect soil and water. The article, published in the Journal of Soil and Water Conservation, was written by J. Gordon Arbuckle Jr., an assistant professor of sociology and an extension sociologist at Iowa State University. “Overall, the results indicate that Iowa farmers have a generally positive view of Conservation Compliance, both as currently configured and in potentially more stringent and extensive forms,” Arbuckle wrote in the abstract for the article. Making conservation compliance a condition for qualifying for federally subsidized crop insurance is a significant issue at present in congressional debate over re-authorization of the federal Farm Bill. Conservation compliance – an effort to link federal subsidies for farmers’ crop insurance premiums to protection of wetlands and highly erodible land – is still a hot issue as Congress works to draft a new federal Farm Bill. Last year, the U.S. Senate approved a Farm Bill that included a conservation compliance requirement for farmers seeking subsidized crop insurance. A bill that passed the House agriculture committee did not include the requirement. The compliance requirement currently applies to several other parts of the Farm Bill that authorize payments to farmers, but not crop insurance. Those other subsidy programs are likely to be eliminated by Congress in favor of significantly expanded crop insurance coverage. Read a recent article –“Conservation Compliance: A 25-Year Legacy of Stewardship” – by Jim Moseley, an Indiana farmer and former deputy secretary of agriculture from 2001 to 2005 under President George W. Bush. The article strongly supports making conservation compliance a condition for qualifying for federal crop insurance. Read an American Farmland Trust description of the issue and Moseley’s article. Read an August 2011 column by Freshwater Society President Gene Merriam endorsing conservation compliance. Nutrient pollution is one of the nation’s most widespread and costly environmental problems. Excess nitrogen and phosphorus from farm and lawn fertilizer, pet and livestock waste, roads and houses, faulty septic systems, and treated sewage can turn waters green with slime and pollute waters for swimming, boating, and fishing. To help raise awareness about this growing environmental problem, the Environmental Protection Agency has released a short video to illustrate the potential impacts of nutrient pollution on recreation. The Choice is Yours: Clean or Green Water can be viewed on EPA’s YouTube Channel. The new video complements another EPA YouTube video, that provides a broad overview of nutrient pollution. Excessive use of road salt – on streets, bridges, parking lots and sidewalks – is s significant cause of pollution of both ground and surface waters. But how much salt is enough to melt ice and snow safely? And how cold is too cold for the salt to be effective? Read a Minnesota Pollution Control Agency news release with tips for safe and effective use of road salt. Here’s a hint: The MPCA says use less than 4 pounds of salt to clear 1,000 square feet of pavement. That’s the equivalent of a heaping 12-ounce coffee mug of salt for an area equal to about seven average-sized parking spaces. Read about the Freshwater Society’s upcoming symposium on road salt and water pollution. Read a recent Freshwater Society newsletter column by Gene Merriam on conservation in the Farm Bill. He urges Congress to adopt a Senate position that would make compliance with some conservation standards a requirement for farmers seeking subsidized crop insurance coverage. Read an investigative report on federally approved injection wells that allow industries to pour waste products into the ground, sometimes contaminating drinking water aquifers. The report is the work of Pro Publica, a public interest journalism project. Read an interesting article from the Southeast Farm Press on proposals for pollution credit trading and agriculture in the Chesapeake Bay watershed. Standing on the banks of the Chicago River, you realize that maybe the best thing about this filthy waterway is that it was reversed over a century ago so it flows away from Lake Michigan instead of into it. Water isn’t even the first thing you notice where the river merges with a notoriously fouled little tributary, dubbed Bubbly Creek for the gases still belching from untold tons of cow carcasses dumped into it by the city’s old stockyards. Floating on the surface is the crinkly corpse of a pink Mylar balloon that’s wrapped itself around a 40-ounce beer bottle. Nearby is a pumpkin stuck in the muck, orbited by an array of tampon applicators and plastic bottle caps. Just below a sewer pipe that excretes a septic stew when big rains hit, a boot floats sole-up next to a tennis shoe; if the pair were a match you’d fret they were attached to feet. University of Wisconsin scientists are studying how mixing the water in a lake could eliminate an invasive fish. The technology works by moving large air bladders up and down the depth of a lake, mixing the water and raising its temperature to where it is intolerable for the fish, said Jake Vander Zanden, supervisor of the study. The bladders are much like gigantic trampolines, Vander Zanden said. They’re about 25 feet across. Air is pumped in and out so it rises and falls. Read a free-market think tank’s argument for requiring conservation compliance in any expansion of federally subsidized crop insurance. Enacting a conservation compliance provision in the now-stalled federal Farm Bill would require farmers receiving crop insurance to follow certain minimum conservation standards aimed at protecting wetlands and reduce erosion. Those compliance provisions were required for farmers receiving direct-payment subsidies under the farm bill that expired Sept. 30, but they were not a requirement for participation in crop insurance. Direct payments are virtually certain to be eliminated, probably in favor of an expansion of crop insurance, in the new Farm Bill that Congress is expected to enact later this year or in 2013. The version of a new Farm Bill passed by the U.S. Senate in June included a conservation compliance requirement for crop insurance eligibility. The version approved by a House committee in July did not. The R Street Institute, a Washington-based non-profit think tank that says it espouses free markets, limited government and responsible environmental stewardship, last month issued a policy statement supporting a conservation compliance requirement. The policy statement argues that all farm subsidies should be eliminated, but says that is not politically realistic and that enactment of a conservation compliance provision is a “second best” outcome. Read a 2011 newsletter column by Gene Merriam, Freshwater Society president, supporting conservation compliance. View video from a 2011 Freshwater lecture in which Craig A. Cox of the Environmental Working group advocated conservation compliance. Read an October Des Moines Register interview with U. S. Agriculture Secretary Tom Vilsack in which Vilsack predicted Congress will not pass a conservation compliance provision. Over the next 23 years, Minnesota will spend an estimated $2 billion in Legacy funds to make its lakes and rivers cleaner. But who’s to say whether that money will be well spent? That those waters will be in appreciably better shape than they are now? That the money won’t go down some big hole or lots of little ones? As the state begins handling constitutionally dedicated money approved by voters in 2008, questions are being raised about the clean-water portion of that amendment. Some activists worry much of that money, especially that dealing with pollution from agriculture, could be wasted or could go to less effective uses. Two weeks ago, this blog took some delight in the recent spotting of a baby Blanding’s turtle in Minnesota’s Martin County. Scientists had feared the threatened species was not reproducing at the study site. Now comes some good news about another species: The rare nine-spotted ladybug. The Coccinella novemnotata is the state insect of New York but has long been thought to be extinct in the state. A live ladybug was found on Long Island in July. It turns out that disappearing ladybugs are a problem throughout the U.S., and there is a Lost Ladybug Project at Cornell University that encourages citizen scientists to look for, photograph and report rare ladybugs. 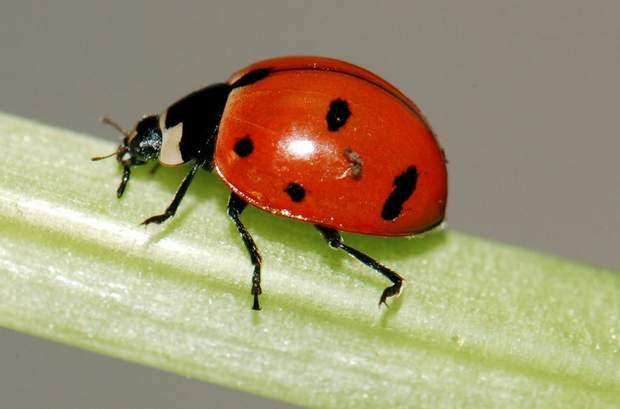 The Associated Press reports that the leading theory about the decline of native ladybugs is that they were somehow displaced by the seven-spotted ladybug, which was introduced from Europe and released as natural pest control to eat aphids on crops. Seven-spotted ladybugs are now common, as are Asian multicolored ladybugs, which were released by the U.S. Department of Agriculture in the 1970s and ’80s to control scale insects on trees. The nine-spotted ladybug was once one of the most common ladybugs in the United States. But by 1999, extensive surveys by scientists failed to find any live specimens. Cornell researchers launched the Lost Ladybug Project in 2000. to enlist children and adults as citizen scientists to survey the ladybug population. TIANJIN, China — Towering over the Bohai Sea shoreline on this city’s outskirts, the Beijiang Power and Desalination Plant is a 26-billion-renminbi technical marvel: an ultrahigh-temperature, coal-fired generator with state-of-the-art pollution controls, mated to advanced Israeli equipment that uses its leftover heat to distill seawater into fresh water. There is but one wrinkle in the $4 billion plant: The desalted water costs twice as much to produce as it sells for. Nevertheless, the owner of the complex, a government-run conglomerate called S.D.I.C., is moving to quadruple the plant’s desalinating capacity, making it China’s largest. In some places, this would be economic lunacy. In China, it is economic strategy. As it did with solar panels and wind turbines, the government has set its mind on becoming a force in yet another budding environment-related industry: supplying the world with fresh water. The Minnesota Department of Natural Resources is seeking public comments on a proposal for a temporary permit that would allow Lutsen Mountain Corporation to continue to draw water from the Poplar River for its snowmaking operation. Normally, pumping operations would be discontinued due to the river’s low flow, but the DNR is authorized by statute to allow exceptions under unique circumstances. In this case, the DNR believes there is just cause to issue LMC a permit based on the potential economic impacts to the local community, the low numbers of trout present in the affected reach of river, and the likelihood that some trout mortality will occur, whether the resort temporarily appropriates water or not. The draft permit and a FAQ with additional background information is available online. The public may submit comments through Nov. 4 at publiccomment.dnr@state.mn.us. A new take on a fairly common conservation practice can do a lot more than previously thought to control nutrient runoff in crop fields, according to new research in Iowa. A project testing the viability of riparian buffer strips to remove nutrients from crop runoff water was conducted this growing season by the Ames, Iowa-based Leopold Center for Sustainable Agriculture. The main target for the research was a 1,000-foot stretch of Bear Creek in Story County, Iowa, where a “saturated buffer” was installed to catch tile-line water before it’s released into waterways. The results: In addition to curbing over half of the immediate tile line outflow into waterways, it removes all of the nitrate output, says USDA National Laboratory for Agriculture and the Environment and lead researcher for the project Dale Jaynes. Pat Nunnally, the River Life coordinator for the University of Minnesota’s Institute on the Environment, will be the next speaker in the Sip of Science lecture series. The series, sponsored by the National Center for Earth-surface Dynamics at the university’s St. Anthony Falls Laboratory, offers scientific discussion in a happy-hour setting. Nunnally will speak Wedenesday, Nov. 9, at 5:30 p.m. at the Aster Cafe, 125 SE Main St., Minneapolis. The River Life Program connects University teaching, research and programs to off-campus partners who are working toward a sustainable river and inclusive planning for our river future. The program utilizes diverse digital platforms and makes strong use of social media to create unique learning opportunities — students learn from practitioners, river agency staff network more with each other, and communities up and down the river can share their experiences. State Department of Natural Resources officials will need to decide whether lowering the level of surrounding lakes and streams by about two inches is an acceptable outcome from a planned large dairy operation, a University of Wisconsin-Stevens Point professor says. People who live near the proposed Richfield Dairy in Adams County asked George Kraft, a hydrogeologist at UW-Stevens Point, to look at the potential impact of two high-capacity wells planned as part of the proposed 4,300-cow dairy operation. Kraft said he doesn’t favor or oppose the wells, and he’s just providing the DNR with facts about the potential effects. The previous owner of the Richfield property where the proposed operation would be located had one high-capacity well, said Bill Harke, director of public affairs for Milk Source, the group that plans to build the dairy. Company officials said in the DNR application the dairy operation would use about 52 million gallons of water annually. A $300 million expansion proposed for U.S. Steel’s taconite operation in Keewatin, Minn., cleared an important hurdle when the Minnesota Pollution Control Agency board voted to approve its wastewater emissions permit. The permit, approved in a unanimous vote, sets a more restrictive level for sulfate emissions than the current state standard. That drew praise from at least one environmentalist who has tracked the permitting process. “It’s a positive,” said Paula Maccabee, an attorney with the environmental group WaterLegacy. “U.S. Steel has owned that plant since 2003, and this is the first time they’ve been asked to comply” with sulfate emission standards, she said. Read a Minnesota Public Radio transcript of Luke Skinner, the Minnesota DNR’s invasive species program director, being interviewed about Asian carp. Five Great Lakes states are asking the U.S. Supreme Court to require nets in Chicago area waterways to stop the spread of Asian carp. The Supreme Court has previously declined two requests from Michigan to close Chicago area waterways to block Asian carp from Lake Michigan. A federal appeals panel in August rejected the request of Michigan, Minnesota, Ohio, Pennsylvania and Wisconsin to close Chicago navigational locks, upholding a district court decision. But the 7th U.S. Circuit Court of Appeals cautioned that the issue could be revisited if ongoing efforts to stop the advance of the invasive species stall. Attorneys General for the five states cited that warning in their appeal filed to the U.S. Supreme Court, asking the high court to overturn the panel’s decision. Looking for snow removal contractor? and ice with minimum chloride pollution of water and soil. Find a list of certified contractors on the Minnesota Pollution Control Agency web site. The state of New York does not appear to be bowing to pressure from a group of Great Lakes governors, including Wisconsin Gov. Scott Walker, to back off on its plan to adopt the region’s toughest ballast discharge laws for overseas ships visiting the Great Lakes. All overseas vessels sailing into the Great Lakes must pass through New York state waters, and in 2013 New York had planned to begin requiring ships to install water treatment systems in their vessel-steadying ballast tanks in order to kill unwanted hitchhikers making their way into the lakes from ports around the globe. This did not sit well with Walker and fellow governors Mitch Daniels of Indiana and John Kasich of Ohio, who in September sent a letter to New York Gov. Andrew Cuomo asking him to back off on the law. They fear it could harm overseas traffic, a sector of cargo flow that in recent years has accounted for less than 10% of the tonnage that moves on the St. Lawrence Seaway and the Great Lakes. Great Lakes states like Wisconsin are pursuing weaker ballast rules developed by the International Maritime Organization, or IMO, that allows for a certain number of species of a certain size to be discharged from the ballast tanks, and ships would not have to meet that requirement until 2016. New York had proposed standards that are 100 times more stringent than the IMO rules for existing vessels and 1,000 times more stringent for ships built after Jan. 1, 2013. The problem, according to Walker and the other governors, is that technologies do not yet exist to accomplish what New York is pursuing. They fret that New York’s rule will affect the whole Great Lakes region because it covers ships that are only passing through New York waters. Any ship visiting ports such as Milwaukee, Toledo or Gary, Ind., must first travel through New York waters on its journey up the St. Lawrence Seaway. Against a backdrop of increasing business exposure to global water supply threats, Ceres released a new tool for evaluating those risks – and opportunities – that both investors and companies can use as a roadmap to enhanced water stewardship. Ceres is a U.S.-based coalition of investors, environmental groups, and other public interest organizations working with companies to address sustainability challenges such as climate change and water scarcity. “Water risks are urgent today and, given population and climate trends, can only grow increasingly more so,” said Ceres president Mindy Lubber, in announcing the Ceres Aqua Gauge: A Framework for 21st Century Water Risk Management. Even as companies accelerate water efficiency and improved water resource management, water pressures are likely to worsen. According to estimates by McKinsey & Company, the world may face a 40 percent global shortfall between forecast water demand and available supplies by 2030. U.S. Secretary of Agriculture Tom Vilsack said that he is not proposing the linking of conservation compliance with subsidized crop insurance, but he is confident that the farm bill will include some kind of regulatory leverage. Proposals to cut between $23 billion and $33 billion from the omnibus farm bill have been floated to the 12-member “supercommittee” of lawmakers making federal budget cuts. The committee’s work, rather than the traditional process of the Senate and House agriculture committees, is expected to frame the next farm bill. John Redmond Reservoir averages just 6 feet deep. The lake, which supplies water to several Kansas towns and the Wolf Creek nuclear plant, now sits with only about 58 percent of its original capacity. From the smallest farm pond to the largest reservoirs, all Kansas lakes are slowly filling with dirt. Sediment, the simple mixture of water and dirt, is considered one of Kansas’ largest environmental concerns by some experts. Currently about 60 percent of Kansans get their water from lakes and that number is expected to grow. Kansas experts say no simple solutions are in sight. China has pledged to make all its underground drinking water safe and to significantly improve the overall quality of groundwater by 2020, a goal that even some senior environmental officials say will be difficult to achieve. All pollution from urban sewage, industrial projects and agricultural activity must be cut off from underground sources so that it will not contaminate the water, said Zhao Hualin, director of pollution prevention department under the Ministry of Environmental Protection. The government also plans to import technologies for groundwater restoration and start pilot treatment projects in the coming five years, Zhao said, citing a national blueprint to tackle underground water pollution for 2011 to 2020, which the State Council issued in August. About 63 percent of China’s groundwater is safe for drinking, and the rest is polluted, according to a nationwide monitoring study carried out by the Ministry of Land and Resources.